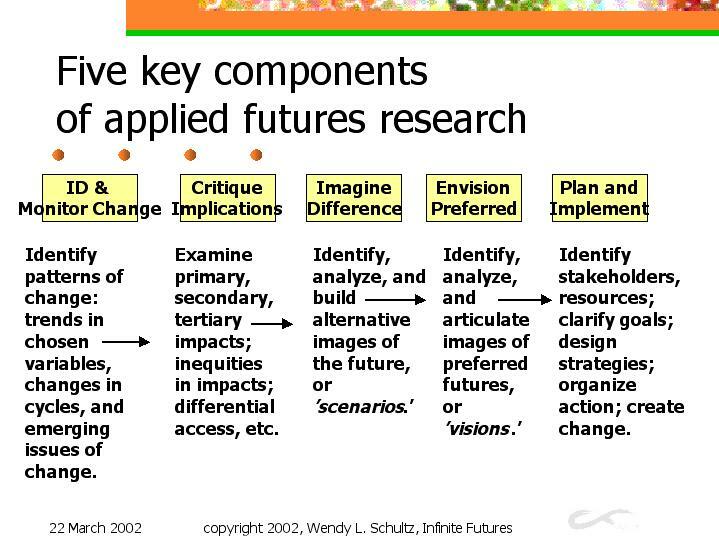 While an applied futures project may be structured in a variety of ways, and its activities scheduled in different order, this basic framework is depicted assuming that you are starting from a blank slate. Some organizations may have a prior history of planning, or even of visioning. In that case, an effective research design may begin by reviewing prior strategic plans, visions, or scenarios. Or, to enhance a sense of identity and transformation, some groups wish to begin with visioning – the articulation and mapping of internal values, hopes, and goals – and then turn to investigations of external conditions and emerging change. If, however, a group begins with visioning, they would be well advised to ”re-vision” after they have collected data on change and built scenarios. Visions articulated after people have had an opportunity to explore change in greater detail, and to imagine a wide range of possibilities, are more detailed and more transformational than visions articulated with no prior exploration of future possibilities.